The doctor called out to me as I shuffled downhill through the snow, going sideways and slowly, trying not to fall over. We’d met over a dinner of suaasat – seal soup – at a neighbour’s house the previous evening. The news had come to him through a friend who had a radio connection to the hunters out on the ice. ‘Nothing happens for weeks here,’ the doctor said ruefully, ‘so make the most of this.’ He’d just returned to the island after several months back home in Denmark, bringing his young son with him to attend the local school. Now he seemed eager to share his knowledge with a newcomer. For my part, I was grateful to find someone with whom conversation ran within familiar patterns, someone fluent in my own language, although he made me feel uneasy and I could not fathom why. There was once an old woman living in a place where others lived. She lived nearest the shore, and when those who lived in houses up above had been out hunting, they gave her meat. And now and again they caught a bear, so they frequently ate bear’s meat. One day they came home with a whole bear. The old woman received a piece from the ribs as her share, and took it home. And the old woman went to collect the cub and brought it home, and because it was frozen, she shifted her lamp, and placed the cub up on the drying frame to thaw. I wasn’t sure that I wanted to see the polar bear. 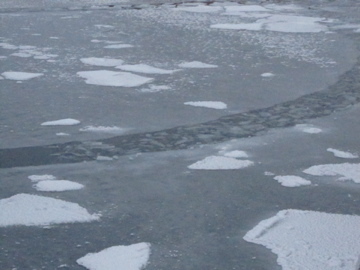 For a start, there was no guarantee of the time the boat would arrive, and I hadn’t yet learnt that particular form of patience the Arctic demands, quinuituq, described by the writer Barry Lopez as ‘long waiting, prepared for a sudden event’. (Lopez observes this patience in a hunter’s ‘long wait at a seal hole for prey to surface.’ Nowadays it is often experienced in the wait for weather conditions to become suitable for a plane to take off.) I told myself that I had so much work to do writing about the island itself, that really, I should just go home and get on. Plus I felt self-conscious in public places: my light skin marked me as an outsider and my command of the local language let me down in the island’s small grocery store and the post office, which flew a blue flag with a polar bear rampant, the coat of arms of Greenland’s self-rule government. What reason did I have to attend the gathering at the harbour? Suddenly the old woman noticed that the bear moved a little, and took it down to warm it. Then she roasted some blubber, and in this way she fed it from that time onwards, and it lay beside her at night. It grew very fast, and she began to talk to it in human speech, and so it gained the mind of a human being, and when it wished to ask its foster-mother for food, it would sniff. The old woman no longer suffered want, and those living near brought food for the cub. In the morning, the children would come to the window and call in, ‘Little bear, come out and play with us.’ It would break the children’s toy harpoons, but when it gave one of the children a push, it would always sheathe its claws. At last it grew so strong that it often made the children cry. Did I go? Of course I did. I was looking for material everywhere, and as the doctor implied, I would have been a fool to turn the opportunity down. Yet five years on, rereading a poem that I wrote shortly afterwards, I have a moment of doubt. Did I really witness all the things I describe in the (now abandoned) poem, or had I sulked in my little house down by the shore and concocted the details from the books I was reading and my own dreams? Such uncertainty is central to my perception of the event. Human understanding of Arctic mammals has long confounded fact and fiction: the narwhal that existed in the European imagination for so long as a unicorn; the sperm whale which dives to deep regions we know less about than the moon, and communicates across frequencies we can’t hear; and the polar bear, whose fur is not white, as so many people believe, but translucent, and grows out of black skin. It was the hope of discovering the reality behind the legends, as much as material for a poem, which drew me to the harbour in the end. Before the bear went out, it sniffed at the old woman. And then it went with the men. The hunting habits of bears have more in common with those of humans than any other animal: both hunt seals using similar techniques, both – sometimes – hunt each other. Some of the hunters on Upernavik push the correspondence further, and still wear the bearskin trousers that have always been their best protection against the cold. There is a traditional belief that once a bear enters its den in the winter, it removes its fur and acquires a human appearance. In the past when a bear was killed certain taboos had to observed. One such taboo ruled that the hunter bringing in the bear had to remove his outer clothes before coming into his iglu, just as a bear was thought to remove its skin once safely inside its den. And so the old foster-mother made a collar of plaited sinews as broad as a harpoon line for the bear to wear around its neck. And after that it never failed to catch seal. It was stronger even than the strongest of hunters, and never stayed at home even in the worst weather. There are two harbours in Upernavik. One, where the huge Royal Arctic Line ship Vestlandia docks in summer, occupies a disproportionate arc of the island’s coastline when the water is ice-free. In winter empty plastic Carlsberg crates and iron shipping containers clutter the land around it. By February, when I was on the island, there was hardly any food remaining in the store. When the shore ice melted, trade and traffic would resume. The island diet was heavily influenced by European (healthy) and US (sweet) culture: the store sold UHT milk, hot peppers from South Africa, lentils from Turkey, wine and beer and spirits from around the world. Food travels a long way to get here, and it’s expensive. There were frozen berries (a Danish brand). Frozen beans. Fish fingers. In central Europe frozen produce has pejorative associations as a convenience food, but here it is preferable to the ‘fresh’ (in fact often accidentally frozen then thawed) lettuces, alien apples and soft grey onions. The second harbour is smaller and less exposed to the heavy tides of Baffin Bay. It lies in the lee of the promontory on which the little hospital stands; people moor their dinghies up against the ice foot there. There are just five or six vessels, and perhaps what goes on here is a little bit secretive, if things can be secretive on a small island. 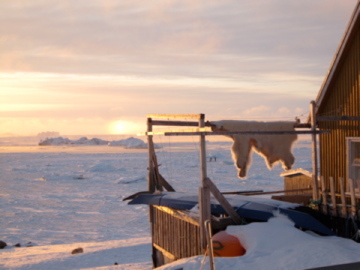 My house was not far away and often in the early mornings as I made coffee and settled down to write I heard the hunters cutting their boats out from the ice that had formed overnight, rasping the engines and setting off to sea. I saw their lights reflected in the dark water as they gingerly steered a path between blocks of ice as far as the horizon. And it heard the foster-mother’s words and did as she had said. And so the old foster-mother kept the bear with her. In the summer it went out hunting in the sea, and in winter on the ice, and the other hunters now learned to know its ways, and received shares of its catch. It was to the small harbour the polar bear was to be brought. Just as the hunter’s boats had left the harbour in zigzags, so those who had not been out hunting descended the steep slope, moving side-to-side across the island down the boardwalks and steps that spanned the snowdrifts on the hill. Walking down a steep mountain your journey takes longer than you might expect. In a casual cortège people came from homes where the living rooms had wide windows looking out over the sea, and a radio in the corner crackling live news from relatives far out on the ice. They came hoping for a share of the meat, because although much of the catch is sold these days, traces of the communal distribution system remain. It was foggy and snowing lightly and we did not see the boat until it was almost upon us. When it grew light, they went out and saw that it was the man from the north, and they could see he had been running fast, for he had drawn off his furs, and was in his underclothes. Afterwards they heard that it was his comrades who had urged the bear to resistance, because he would not leave it alone. The huskies, chained down to plots of urine-soaked ice, shared the islanders’ excitement. They could smell blood, and strained to be free. The little dinghy chugged towards the ice shelf and the hunter, a stout man who appeared even stouter on account of his insulated jacket, waved his gun at the crowd in greeting and in triumph. There were murmurs in return. The boat was moored and then what was inside the boat had to be hoisted ashore. The hunter attached a rope to the animal and threw the loose end to a group of men standing on the ice, who heaved until the carcass leapt ashore as if the boat had given birth to it. It slithered stiffly across the ice, fur stained from swimming through its own blood, and as they pulled a bullet wound unrolled a red carpet for the hunter to step on. The tongue slumped out over the teeth and froze fast to the ice; this blue muscle had to be chiselled free before the hunter could raise the head, buckle a collar round the neck and strap the carcass to his sled. A woman touched the fur gently, perhaps to gauge its quality. Two small boys wearing rubber boots kicked it in the back, and ran away. I longed to touch it, but I dared not – although I could see that it was dead. The huskies continued to howl, but no one released them. But the bear thrust its muzzle right down to the floor and wept too, so greatly did it grieve to go away from her. After this, the foster-mother went out every morning as soon as dawn appeared to look at the weather, and if there were but a cloud as big as one’s hand in the sky, she said nothing. The bear would be taken to be flensed and cleaned, the flesh divided according to traditional principles. Once skinned, a bear looks almost human. Ancient sculptures play on this resemblance, such as the tiny ‘Flying Ivory Bear’, an attenuated form which from one angle appears bearlike, and from another, human. A score of geometric lines across its surface could be the skeleton of either beast. The person who carved this fragment of ivory, working in the Arctic during the Middle Dorset period (AD 0–500), looked back to an even more distant past, when there were no boundaries between humans and animals: they could talk to one another and transform themselves at will. This amulet may represent the bears that led shamans on their journeys through the air or the animal spirits that were called upon when a hunter needed particular strength. The next day I walked all round the island, hoping to learn what had happened to the bear, or even to see its skin hanging outside one of the houses. I’d read that hunters had once paid respect to the bear’s soul (tatkok) by hanging the skin in an honoured place for several days. But everything looked just as it normally did, a little obscure in the stormy winter twilight. The bear had disappeared. When the bear was ready to set out, the old foster-mother, weeping very much, dipped her hands in oil and smeared them with soot, and stroked the bear’s side as it took leave of her, in such manner that it could not see what she was doing. The bear sniffed at her and went away. The old foster-mother wept all through that day, and her fellows in the place also mourned the loss of their bear. I left the island a few weeks later. The weather had cleared at last and the twin otter plane achieved a graceful take off from the small airstrip in the direction of the rising sun. The pilot detoured from his direct route to Qaanaaq, and banked the plane sharply to show his passengers where the bear had been killed. Everyone craned their heads to look. He switched on the intercom. And told the story in his own language, for those who could understand it. Nancy Campbell is a writer and book artist. Recent works include The Night Hunter and How To Say ‘I Love You’ In Greenlandic: An Arctic Alphabet which won the Birgit Skiöld Award in 2013. Her first poetry collection Disko Bay will be published by Enitharmon Press this autumn.